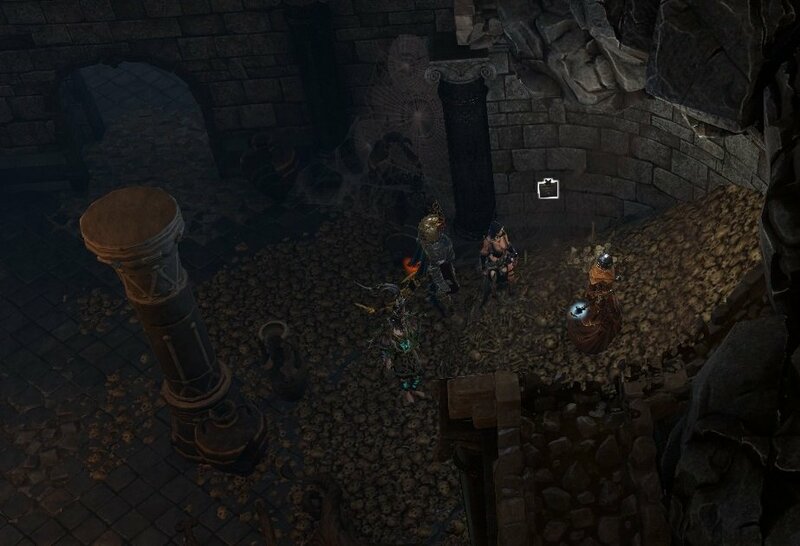 All In The Family is a Quest in Divinity: Original Sin II. A scrap of paper tells of a strange object that drove Johanna Surrey to madness. The numbers 2, 1, and 3 were scribbled in the margins. Tarquin asked us to retrieve the powerful artefact from the Surrey family crypt. Find the second artefact Artifact. 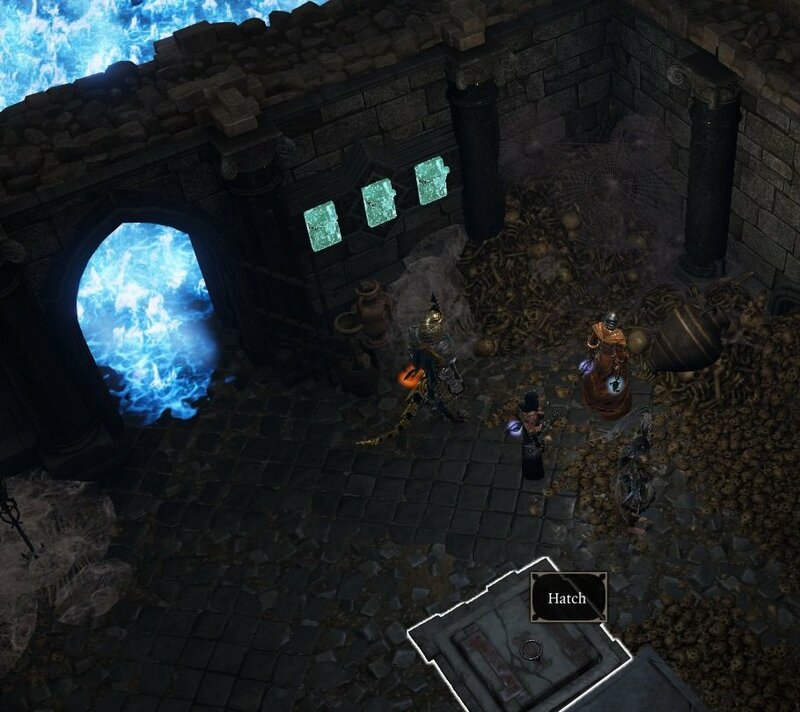 At the gate of Stonegarden in Reaper's Coast, Tarquin asks you to investigate a family crypt and retrieve something for him. 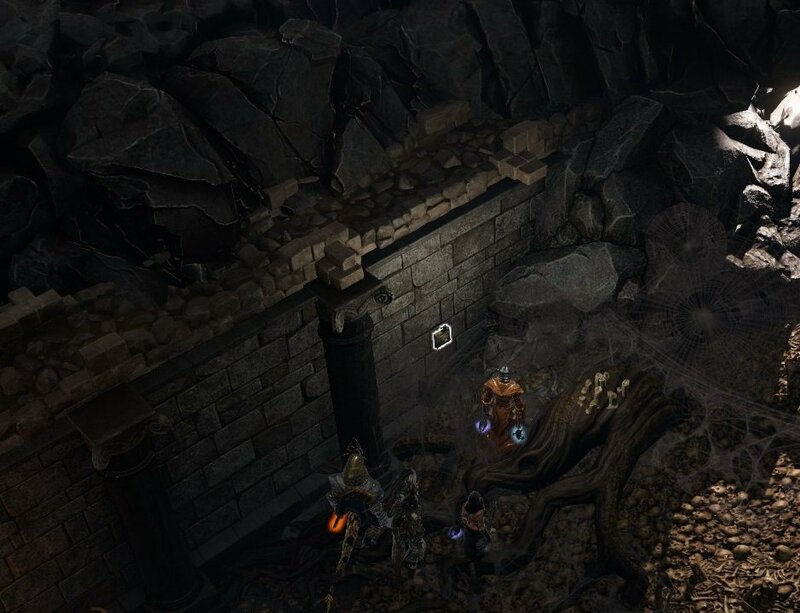 You can get the key from a petrified sourceress, Qanna found in the crypt guarded by the hound (the crypt is close to and directly north of the family crypt and is flanked by two knight statues). Cast Armor of Frost, or Bless on her inside the crypt to depetrify her and she will talk to you. If you fight with her she will spawn undead minions, but kill her and they will disappear so just focus her down. Note that she CAN be damaged (and even killed) while she is petrified, so if you want to talk to her, you can take her down to a sliver of health, talk, and then un-petrify. A single Marksman's Fang will ignore the armor and likely kill her. Next head to the family crypt and open the door. In the first room of the family crypt, there are two buttons on the wall, you need to get close to find them. Press these the buttons to open the stone gate. Teleport one of your companions into the third room and have them step on the pressure plate. Then cast Spirit Vision (Learned in Powerful Awakening), you will see three levers on the wall in the second room with the sarcophagus. Press the levers (middle-left-right) to reveal a secret hatch. If you have already touched the levers since stepping on the plate, in some other order, then you need to "reset" the middle lever. Pull the middle lever until water comes out, then do left, then do right. There's a treasury under that hatch, use your character with highest lucky charm to loot them. The artefact is in the sarcophagus, if your character is a lizard, he/she will recognize the language of demons. When you try to leave the tomb, all clay sentinels will revive and attack you. The fight can be avoided by fast traveling to the Stonegarden waypoint. Report to Tarquin, he will tell you the other pieces of artefact is on Bloodmoon Island. Inside the vault is the other half of the artefact. Focus on killing the two Clay Sentinals at the top of the steps (one on either side of the sarcophagus) to avoid them reanimating already killed Clay Sentinals. If Tarquin is missing for you, one possible solution is to travel to The Lady Vengeance waypoint, take the rowboat on the side to shore, then take the rowboat back to The Lady Vengeance. Tarquin should be standing next to the rowboat at this point. 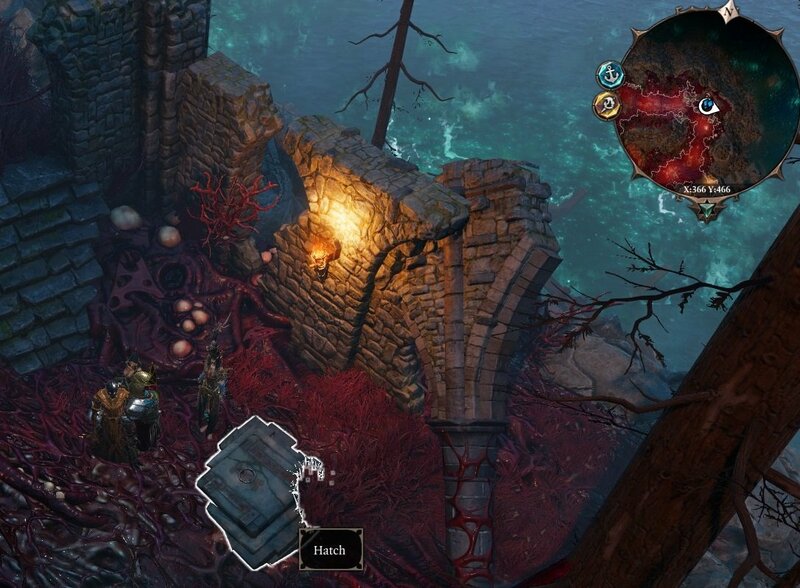 If Tarquin doesn't show up at the graveyard at all you might have played too far ahead in Reaper's Coast. 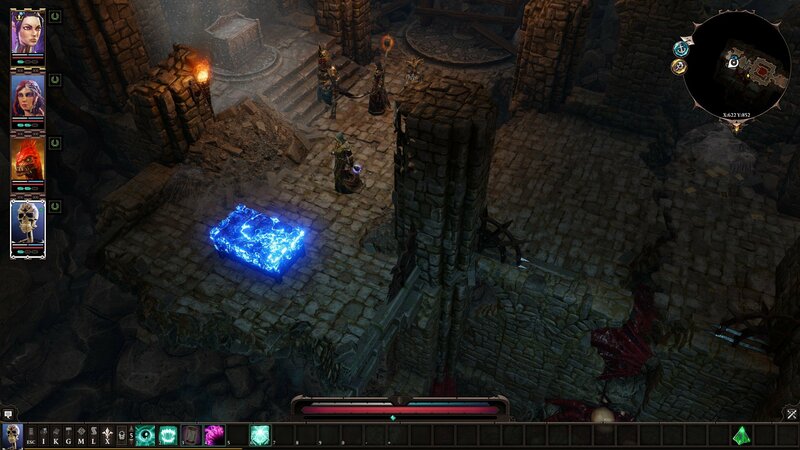 Try loading a save just after arriving in the area and head straight for the graveyard through the Paladin Bridgehead. You can get the quest and then continue on wherever you want. You can use other silver items (Silver Glass) to produce the Silver Lever Shaft on the Ancient Forge at the Bloodmoon Island. There's a glowing chest inside the crypt where you get the second artefact piece, "unusual blade". Make sure to lockpick then open it, it has the green Teleporter Pyramid in it! Another strategy for the clay golem fight is to launch love grenades, avoiding the 2 "boss" golems. For me, the effect lasted 2 turns or so with the minions killing the bosses and some of the untargeted groupies. with the remaining turn, perform all the AOE you can. i love fextralife, but for this quest, allthegamer has better info. Bless a char with high strength before opening to counter being petrified. The sarcophagus needs to be opened twice to get the loot. My polymorph with Medusa&apos;s Head could not open the lid due to lack of strength, don&apos;t know if that even works. Opened the lid with my tank, got petrified, medic did Armor of Frost on him, tank got the loot without issue. In DE, each of the petrifying marauders in the gated crypt give 3875xp upon attacking and killing them. Note that using bless or armor of frost on them will only turn them into bone dust and will not provide the EXP. If you have someone with Medusa Head skill you can cast it and open the tomb lid without being petrified. No idea why but my game had no Qanna or any other petrified persons in the crypt. Still able to get the blade but odd nonetheless. My character has 18 wits but still can&apos;t see the hatch. Did i do something wrong? Ay uh tarquin was mad shady so I bodied that foo on the ship deck by accident and saved it. No way to repair this otherwise? It&apos;s amazing the lack of detail in these. Who the hell wrote this crap. I wish I had waited to give him the parts until I was ready to set sail. After receiving the parts he is not available as a vendor and he has good stuff. For anyone having trouble finding Tarqin at the graveyard to start the quest, remember he wiil hang around either the southern or northern gate depending on which one you approached first. (I generally go straight to the Hens and to help the crazy grenade lady first, so he is usually at the rear one for me. Even if I don&apos;t go all the way to the gate. However one time when down in the well I entered Ryker&apos;s through the basement. This caused him to hang around the Northern Gate). Also once you&apos;ve spoken to him after claiming the hilt he will return to the lady vengeance and you will find him there. Tips for clay sentinels. Petrify from the medusa head will freeze the room as they have no magic armor (in normal mode) BUT they have to all be activated. bring elemental barrels, explosive is best. put a barrel in each group. initiate the fight from the center of the room with pyromania. burn them all to death and any that are resurrected by the 2 with magic armor will burn to death a second time due to lingering fires. Tarquin isn&apos;t at the Graveyard and not on Lady Vegance Either for me! On the Bloodmoon Island the hatch isn&apos;t there! :( Is it a bug or something else? I can&apos;t find Tarquin at the Graveyard (Tarquin isn&apos;t at lady vegance either!) and on the bloodmoon island the hatch isn&apos;t there! :( Is it a bug or something else? I had so much fun with the sentinels. I walked in with only 1 character but he had boneshell armor and got 3000 armor every cast and could wipe the half room with 1 aoe cast. These sentinels are deadly if you play Tactician and go the "normal" way..They wiped me out because of the mistake to create holy fire so they heal from that.They hit hard and hit the same party member until is dead.The spear is long range melee.Better to start the fight yourself instead of going to the exit and start normally. I&apos;ve collected the first piece from the tomb, but since then Tarquin is missing. He&apos;s nowhere to be found at the graveyard, even after trying the rowboat reset. Have done many many hours play since then. Won&apos;t be reloading back that far. Can only hope this is bug fixed.